This is the book that put Geof Darrow on the map. Frank Miller's over-the-top script was tailor-made for Darrow's insanely detailed, pyrotechnical approach, which went to have a tremendous impact on the form. This work – and Darrow's art i particular – has informed and been incorporated into the styles of countless comics creators around the world. 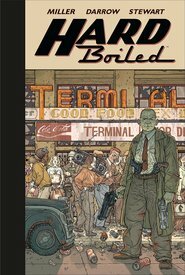 It has now been reissued by Dark Horse in this fine hardcover volume, as a part of their uniform edition of the works of Geof Darrow. "My name's Nixon. I'm a tax collector..."